Shares in Bayer dove more than 11% Monday after a landmark ruling against Monsanto, a US agriculture giant owned by the German pharma giant. Monsanto was ordered to pay $US289 million to a groundskeeper who alleged that the ingredients of a weedkiller produced by the company caused him to develop cancer. Johnson suffers from non-Hodgkins lymphoma, and alleged that frequent contact with glyphosate, an ingredient in Roundup and RangerPro weedkillers produced by Monsanto, had been a substantial contributor to his illness. You can track Bayer’s share price on Markets Insider. 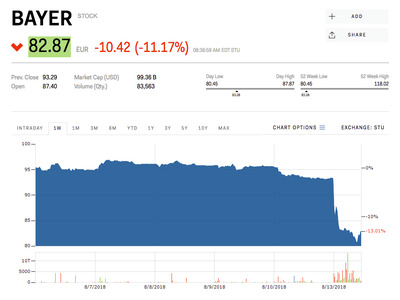 Shares of German pharmaceutical giant Bayer plunged on Monday, the first day of trading after a landmark legal ruling that could cost the company almost $US290 million. On Friday, Monsanto, the huge American agriculture business owned by Bayer, was ordered by a California jury to pay damages of $US289 million to high school groundsman Dewayne Johnson after he claimed that ingredients used in a weedkiller had contributed to his cancer. Johnson has non-Hodgkins lymphoma, and alleged that frequent contact with glyphosate, an ingredient in Roundup and RangerPro weedkillers produced by Monsanto, had been a substantial contributor to his illness. Bayer denies that glyphosate causes cancer when used correctly. Johnson’s was the first lawsuit to go to trial alleging glyphosate causes cancer, but Monsanto faces more than 5,000 similar lawsuits across the United States. The fine sets a precedent for future cases against the company. Investors have taken flight from Monsanto’s owner, Bayer, as a result of the decision, and the fear of further similar rulings, with shares shedding more than 10% of their value on Monday. By 1:30 p.m. BST (8:30 a.m. ET), shares are trading at €82.87 ($US94.52) per share, a loss of 11.1%.